When it comes to travel fashion, I live by the belief that what I wear in my daily life should work for travel and vice versa. Unless I need technical gear (for example, a thermal suit for Antarctica), my regular clothes are what I wear when I am on an adventure. This means I don’t waste money on buying or maintaining travel clothes and that I am assured of being comfortable and confident in whatever I pack, no matter the destination, activities, or climate. On the point of climate, it is expected to be about 116°F/47°C in my metro area today and I am really happy to be traveling for business. Even though my current location is a gorgeous 75°F/24°C I am still relying on my go-to hot weather tops for a bit of comfort and style. Now, most Pinterest pins would have you believe that the only option for hot weather tops are strappy camisoles. While that may work for the beach, a camisole really isn’t appropriate for most other places. When you travel it is best to blend in with the locals. If you are not at the beach or a summer resort town, you will stick out in a camisole or tank top – and not in a good way. Being appropriate, stylish, and comfortable in the summer heat may seem like a lot to ask but thankfully there are several options available that work for a variety of body types, ages, and situations. About two years ago, I discovered a shirt at Banana Republic that was a polyester crepe material with a dolman sleeve and a split neck. It was perfect, so I bought it black and white. Thin enough to tuck into a pencil skirt for a polished professional look when I meet with clients (under a jacket to start the day) and yet relaxed and flowy when untucked to be casual, comfortable and smart with shorts (at the beach). It only came in those two solid colors, so when I found a similar version Nordstrom, I grabbed the black/white prints (2) and the black/blush print (1). These five blouses have been my go-to tops for hot summer weather ever since. Below are three of these “all-stars” from my closet. Sadly, the Banana Republic version hasn’t been available since 2015 and the Pleione version seems to be sold out. The good news is that with some effort, I did find a few of the Pleione version over on Poshmark.com, including this one. If you can’t buy that one, never fear! There are other options out right now that offer the same great material and flowy shape. There are Pleione blouses in the “Kim” style over at Nordstrom Rack in a variety of colors and patterns, including those shown below. If you like these ORDER IMMEDIATELY, as there do not appear to be many left. The big difference between this style and what I have is the length of the sleeves. This model has cap sleeves versus the dolman style on the earlier versions. This style also has buttons on the placket and a chest pocket. My latest find, the Petal Sleeve Clean Tee from Loft, is also a great option if you like a crew neck. I just got three of these – black, black/white stripe, and (stop the presses!) red. I don’t have much color in my wardrobe (90% black and 10% grey, white, navy, and blush) so the red for me was quite the departure and I am glad I got took a chance since this is a gorgeous deep color – saturated rather than bright. This photo makes it look a bit more melon/coral than it is in real life. It is has a button-closure keyhole back that is a bit tight to unbutton at first. The striped version (labeled as whisper white) is not that sheer. I tested in with several printed things (magazine ad, newspaper article, and coaster) and couldn’t see any of the through the material. YMMV (your mileage may vary). The sleeves are a great length; neither too long or too short and the petal style is very pretty without reading to young or too old. The sleeves may be a bit restrictive. On closer inspection, I noticed that the ‘petals’ of the sleeve are stitched together which creates the petal effect AND a band at the front of the arm, where the bicep brachii meets the deltoid. In my regular size the shirt was perfectly flowy BUT this band was restrictive so I sized up to resolve the issue and can live with the slightly too large fit. That noted, the striped version does fit a bit tighter than the solid colors. The lower sides of the shirt also have a petal effect. The sides are open, but at 5’3″ I feel like I have plenty of coverage as the shirt is closed to the top of my hip bone. This means I could tuck this in and the, blouse it over a skirt/pants waistband and not have it gap. If this was an issue, it would be super easy to tack it closed with a few stitches. The material is super lightweight, breathable, and can be dressed up or down. This is NOT the polyester of the 60s and 70s. No shiny, flammable fabric here. The length of this style can be worn over your pants to cover your bum but the material is so light weight, you can easily tuck or half-tuck it into any waistband. Sometimes, I will change up the look by gathering the excess material to one side and then, ‘knotting’ with a clear elastic, making a rosette out of the tail. Blouses or shirts in this material pack into nothing and wrinkles fall out quickly. If that weren’t enough, they can be washed in a hotel sink easily and dried in no time, even in humid locales – a true all-star for travel! Uniqlo (US) – French sleeve blouse in rayon and available in four colors. I love rayon, but in my experience it can shrink, even in cold water. Kohl’s (US) – Crepe blouse available in three solid colors and three patterns. It does look like it runs closer to the body that the other blouses I’ve included in this post, but it may be worth a shot. 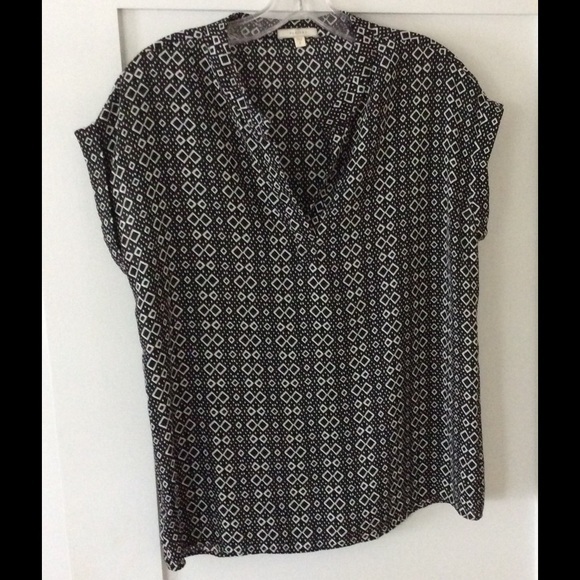 Express (US) – A button up dolman sleeve shirt, this is a great option but may be a bit too short on the front hem. A solid color option of the same, available in three colors. Boden (UK) – Drapey viscose crepe blouse in two colors and six prints. I LOVE the ivory blossom print, it looks like ice cream sprinkles! This looks like a great option unless you don’t like your upper arms. H&M (UK) – A viscose crepe top disguised as a tee-shirt. Available in six colors, this seems to have a slit down the side so be sure to try it on. This H&M option also looks good and comes in two solid colors and one print but does have side slits, so it may not work for you. If you like to keep your arms covered, I can recommend the Portofino blouse (original fit) from Express. These are almost the stuff of legend due to the universally flattering camp shirt cut, style versatility, and breathable, easy-to-maintain fabric. I am not sure what Express is doing with these, as the color and print options are very limited. I was able to find two solid colors (black and white) and three prints (leopard, dot, and black piping on a white shirt). They seem to be moving to the slim fit version of this, so stock up now if you are a fan of the original fit. There you go, some options for versatile and smart summer shirts that you can wear on your hot weather adventures and at home! What do you think? Do any of these work for you? Do you have a favorite all-star summer shirt that you wear time and time again? Let me know in the comments and thanks for stopping by!